This four cluster, 3-story, 32 unit residential condominium complex is proof of the quick and efficient experience multi-family projects receive when building with SIPs. The Lincoln, MA buildings have a complete Insulspan® Structural Insulated Panel (SIP) System. This includes 6” walls and a 10” roof. In fact, MinuteMan Commons stands as an ideal example of what happens when you build with SIPs. Insulspan supplied structural insulated wall and roof panels, along with prefabricated floor and partitions, to rapidly erect the building shells. The Mayo Group was the general contractor on this residential project. 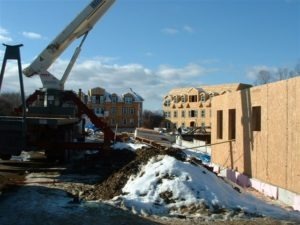 Construction on the buildings was quick and efficient thanks to the prefabrication of the SIP panels. The expansive construction site allowed multiple processes on each building to be performed at the same time. Cranes helped easily place the panels. The residential units were more than a quick and efficient build. They offer amazing energy efficiency due to the high R-Value of structural insulated panels. Building with SIPs improves energy efficiency. Learn more about Thermal R-Values when you build with SIPs, here.